The Clothing of the English and European Forester, Woodsrunner or Woodsman in the New World. 1700-1760. The clothing of the eastern forester whether man or woman is probably the easiest to come by and the least expensive. They are practical, hard wearing, cool in summer, warm in winter and best suited for historical trekking. The following is a list of the basic items; Indian influenced woodsmen, Indians, white and black Indians, and courier de bois wore the same or similar dress excepting possibly the wide brimmed hat. Low crowned wide brimmed wool felt hat. Black was a popular colour, but dark green or brown is also acceptable. Linen, cotton or wool shirt. I suggest you carry a wool shirt in your bedroll for winter night use. Linen, cotton or wool waistcoat. This should reach to just above your knees. Breeches or breechclout. Linen, cotton or leather. The breechclout may be lined. Leggings. Leather and reaching from just above the knees to the foot and long enough to fit over or inside the moccasin flaps. Moccasins. Leather, woodland Indian style. The center seam moccasin is easy to make. I extend the flaps to wrap around and reach up above my ankles giving me more protection. Stockings or socks. Linen, cotton or wool. I prefer stockings that reach up over the lower leg of my breeches making it easier to put on my leggings. Smock or hunting shirt. This garment is of the pull over style and can be made on the basic shirt pattern. Open neck, linen or tow, this fits over all other clothing unless you also wear a coat, match coat, blanket or half blanket and it should at least reach your knees. Half blanket. The half blanket is just that, half a blanket. This can be worn folded and pinned over the shoulder in winter. I use a brass trade ring clasp or brooch to secure my half blanket in the front but you can also fashion a wooden pin. Neckerchief. Linen or cotton. To be on the safe side I would stick to dark solid colours. Mittens. I have a knitted wool pair and a pair I made out of blanket material, which have a woven cord securing one to the other long enough to reach from my hands up and around my neck. The New World Woodsman 1700-1760. His clothing, arms and equipment by Keith H Burgess (unpublished manuscript) and other sources listed therein. Today picture is of my good friend Shane. He was a good man with a great sense of humour. Unfortunately Shane died several years ago and is still greatly missed. This picture shows Shane at Rendezvous with his Brow Bess. This picture also shows some of crafts you practice when you are involved in historical re-enacting. Shane has on a hand made period style shirt and breeches. He made is own woodland Indian centre seam moccasins. Shane bag has a hand woven strap and he made the bag, belt pouches and powder horns. In the background is my wife and she is wearing woodland Indian costume that she made herself and standing in front of the hand sticked linen tent that I sewed for the rendezvous. One of the great things about this activity is that there is such an opportunity to learn new crafts and skills and for all age groups to be involved. 18th century sashes that my wife and I have made. They are made to go once around the waist and tie by the fringes. This is the correct way to wear them for this period. The beaded fringes are a lot of work but well worth the effort. There are also tin cones on the fringe ends. to go trekking as I would like. The autumn is starting here and as the temperature drops I like to get out more. Unlike some who enjoy trekking in the warm weather I like the cooler times and love a snowy winter day. In this shot I am resting after a walk in Butterfly Valley (so called because at certain times of year the valley is filled with butterflys). You can see my 60 calibre fusil propped againcst the tree. I find my homemade mocassins the most comfortable footwear I have. So much so that I wear them around all the time if the situation allows. I like to feel the ground when I walk. My wife and I work together on some projects. In this case she did the sewing and wove the strap and I did the beading and finishing. She provided the hair for the "scalp locks" and I did the cone work. The result of this team effort is a very neat smallish bag in the Indian style . The fabric is dark green pure wool and the beads are number 7 white French glass beads. 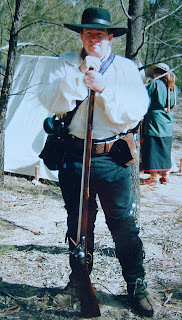 One thing I have been trying to find out for some time is about the use of belt pouches in the 1680 to 1750 period. I have documented accounts of the use of cartridge cases but not of any other type of belt pouches. I have seen photographs of reenactors wearing them but have never seem any primary source material that supprts this practice. If anyone has any information on the use and type of belt pouches I would love to hear from you. This is the title page that describes the attractions of settlement in the New World. Most accounts of the "excellent Fruites" of life in Virginia were, like this one, written by people who had never seen America but sared the excitment that the colonies inspired among the early 17th century English. (New York Public Library). The biggest problem we having finding new membership is explaining what our group is & what it is we do. Terms like colonial skills or primitive skills mean different things to different people. I could say that we emulate or re-enact a New World colonial lifestyle or even a “Daniel Boone Life style " but even these terms do not guarantee, that someone out there who might really enjoy doing this stuff will understand what I am talking about. So if there is anyone out there who thinks it might be fun to join our group but wants more information, just drop me a line. Apart from our normal activities we have an old fort that is badly in need of repair &I have a cabin to build out in the forest somewhere. If anyone is into learning long-term wilderness survival skills, practicing 18th century historical trekking is the way to go. With the skills, clothing & equipment we have & use you can survive in the wilderness indefinitely. I have a saying, that when packing for the trail, it must be a compromise between minimum weight & maximum self-reliance. We don't carry a lot of equipment; the more skills one learns the less equipment one needs. Through experimental archaeology, wearing the period clothing & using the period style equipment to perform primitive skills, we gain a better understanding of what it was like to live &: survive on the new World frontier during the early to mid 18th century. We would also like to form a 'Train Band' or militia. Anyone who thinks they could handle the job of Captain should contact me. No experience is necessary, just a willingness to learn. Same goes for other militia members. Our main period of interest is 1720-1760, but, we can go earlier & later to suit individuals. If there are any other groups out there that share our period of interest, (or individuals) it would be good to hear from you. Perhaps we could share research information & activities ideas. Does anyone know of any good web sites with information on 17th - 18th century common items such as tin containers & belt buckles? In a private forest 35 km from Armidale the New England Colonial Living History Group reenacts a colonial lifestyle in the New World. This group of dedicated history buffs and outdoors people wear the clothes and use equipment from roughly 1720 to1760. The standards of historical authenticity are high within this group but they are not an elitist or closed group and are constantly looking for new members. Historical trekking, mid 18th century period living skills and wilderness survival skills are a major part of this group’s activities. The historical treks are fun, challenging and test the skills of participants, their clothing and the equipment they carry with them. Trekkers learn all the skills and tricks of keeping warm in winter and surviving in the wilderness. 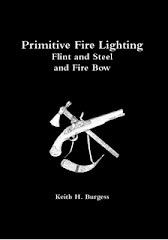 Fires are usually lit using flint and steel and a tinderbox, but participants can also learn how to make fire with a fire bow. Period style foods are cooked over an open fire using only a period style cook pot and other items fashioned in camp. Some period foods that don’t require cooking are always carried incase it is not safe to light a fire or if the trek scenario dictates that no fires are allowed, for example, traveling in hostile country usually dictates a “cold camp”. There were “woodswomen” as well as “woodsmen” in the 18th century and there are no age restrictions in this group. For those that don’t wish to trek on foot there are drive-in camps and ordinary regular meetings with plenty of opportunities to learn a wide variety of period skills, or just relax, eat and drink and watch others practicing skills. Regular meetings are a time to relax and share research information or show a piece of period equipment recently acquired. Children can learn wilderness survival through “survival games” such as building a simple survival shelter. Children gain a real insight into life in another time and history comes alive for them. Regular meetings and camps are also a good time for some friendly competition tomahawk throwing or practicing other skills such as finger weaving, making cordage or flint and steel fire lighting. Reenacting a New World colonial lifestyle allows group members a large range of personas, activities, nationalities, skills, crafts, equipment, clothing styles and trekking scenarios to choose from. There is in fact such a wide range of skills and activities that there is something of interest for everyone and all ages. This makes mid 18th century living history an ideal activity for families where members can learn together and from each other. Today’s world is sadly lacking in the adventure and opportunities for adults and youths that was available over 250 years ago. Modern adventures often carry a high price tag that few can afford, especially low-income families. Living History is only as expensive as the individual wants it to be. Most participants make a lot of their own clothing and equipment and trade for items they cannot make or don’t wish to make themselves. In 18th century living history you can be anyone you want to be and follow a trade or occupation that you won’t find at any modern “job center”.